AKIPRESS.COM - Oyu Tolgoi today announced an update on its performance for the quarter ended March 31, 2017. In the first quarter of 2017, Oyu Tolgoi was injury-free for 79 out of 90 days. Oyu Tolgoi achieved an All Injury Frequency Rate (AIFR) of 0.42 per 200,000 hours worked for the three months ended March 31, 2017. Revenue of $237.5 million in Q1’17 was 5.7 per cent higher than Q4’16 reflecting a higher average selling price for copper and higher volumes of copper in concentrates sold. Underground lateral development, sinking of Shafts 2 and 5, support infrastructure and the convey-to-surface system all progressed during Q1’17. Oyu Tolgoi spent $136.4 million on underground expansion during Q1’17 and awarded several large contracts during the quarter with the largest for the decline material handling system. Oyu Tolgoi’s concentrator performed very well during Q1’17 with record throughput for the quarter. Ore treated during Q1’17 increased 2.7 per cent over Q4’16 and average daily throughput of 112,100 tonnes for Q1’17 increased 5.1 per cent over Q4’16. Oyu Tolgoi continues world-class environment performance, with only 0.4 cubic metres of water per tonne of ore processed – a third of the water use compared to similar operations worldwide, and achieving an average water recycling rate of 88.7 per cent over the period. 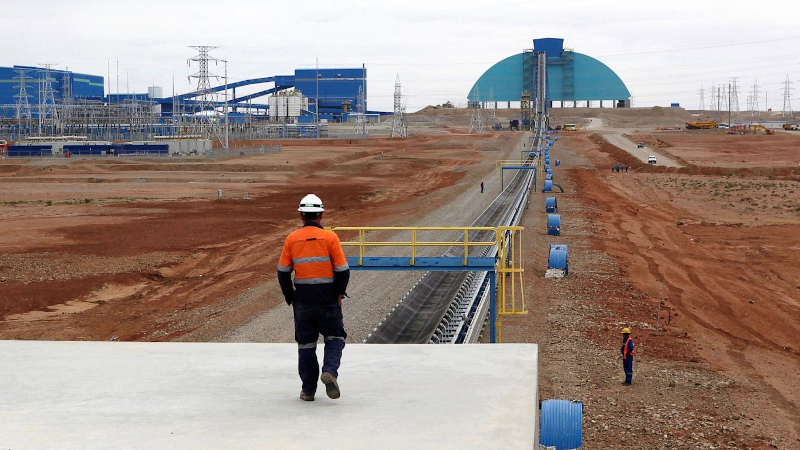 Armando Torres, CEO of Oyu Tolgoi, said, “Oyu Tolgoi achieved real progress over the first quarter of the year. We continue to focus on safety as our foremost priority, even as we achieve record breaking performance in key operations areas, and drive momentum in the underground project. This success is a real demonstration of the skill and capability of our workforce, 93 per cent of who are Mongolian. In Q1’17, Oyu Tolgoi spent $75 million in national procurement, with increasing local content. The company hosted the annual Gobi Gem awards in Umnugobi recognizing the achievements by national suppliers and continued to engage the business community through monthly open sessions. Turquoise Hill expects Oyu Tolgoi to produce 130,000 to 160,000 tonnes of copper and 100,000 to 140,000 ounces of gold in concentrates for 2017.